Performers include: Florence Henderson, Robert Reed, Ann B. Davis, Maureen McCormick, Barry Williams, Geri Reischl, Christopher Knight, Susan Olsen, Mike Lookinland, Rip Taylor, Robyn Blythe, Susan Buckner, Darine Klega, Lynn Latham, Charkie Phillips, Judy Susman, Chris Wallace, Linda Hoxit, and Van Snowden. A strange and short-lived spin-off to The Brady Bunch in which Carol (Florence Henderson) and the Brady kids convince dad Mike (Robert Reed) to quit his job as an architect so that they can all host their own comedy-variety show. Housekeeper Alice Nelson (Ann B. Davis) appears occasionally to take part in the musical numbers and skits. Crazy Jack Merrill (Rip Taylor) helps to produce the show and performs on stage as well. 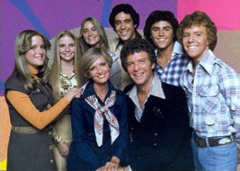 All of the Brady Bunch kids (Barry Williams, Christopher Knight, Mike Lookinland, Maureen McCormick, Susan Olsen) return for this spin-off, with the exception of Eve Plumb who played middle sister Jan. Plumb is replaced by Geri Reischl. Guests: Paul Williams, Lynn Anderson, and Rip Taylor. In a sketch, Mr. Merrill begs Alice the housekeeper for a date and she finally agrees. She’s peeved because she was expecting Esther Williams, not Paul Williams. Greg wants to pitch songs to Paul and Marcia’s annoyed. When Paul shows up, he becomes infatuated by Carol. Later, Mike confronts Paul about his supposed love for Carol. Before he leaves, Paul offers Carol a piece of jewelry that belonged to his grandmother and she accepts it. Lynn stops by soonafter and says that she ran into Paul outside. He told her that he loves her and gave her jewelry from his grandmother too. Paul introduces a sketch about “The Columbus Bunch” from 15th century Genoa. Mike Columbus sets out to prove that the world is round. Merill plays an over-the-top King of Spain while Alice plays his Queen. The Bradys returned in a number of series and specials but none that were related to this particular series. The series was developed without the permission of Brady creator Sherwood Schwartz or Paramount. The studio agreed to it at the last minute and Schwartz, who didn’t want to deprive his former cast of employment, reluctantly okayed it. You will not however find any mention of the series later Brady stories. By all accounts, the characters seem to have forgotten that it ever happened.